We’ve finally come full circle, it’s one year now since the garden was first built and I started documenting it all. I’ll take you through some of the interesting bits first, then we’ll go into the analysis to see how it fared! The most wonderful thing about Spring is the flowering of trees and re-emergence of plants as they awaken from their winter slumber, ready to grow once more to their full glory. The cherry tree is in full flower, so we should expect an even bigger harvest of cherries. I didn’t get to record the previous harvest because the huge bowl full was eaten before I got to weigh them! Most cherries require a pollinator, and grow very tall. This tree is a Starkrimson variety, a dwarf tree growing to 4m, and is self-fertile. This is ideal for back yards and is a heavy bearing variety that produces very tasty cherries. And it’s not only the cherries in flower, the apples and pears are following suite too! 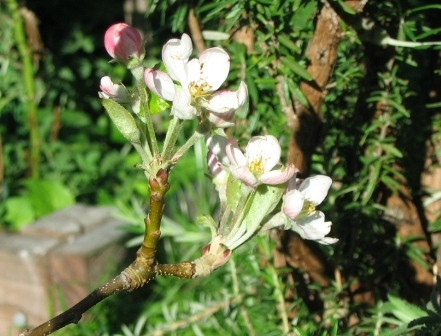 The Pink Lady and Granny Smith apple trees (they are pollinators for each other) have a fair few flowers, this will be their second year in the ground. Last year only the Pink Lady apple tree produced two delicious apples, not a bad feat for a two foot high tree! And yet more apple blossoms! 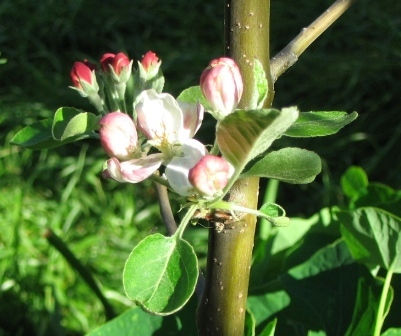 It appears that the pears flower later than the apple trees. 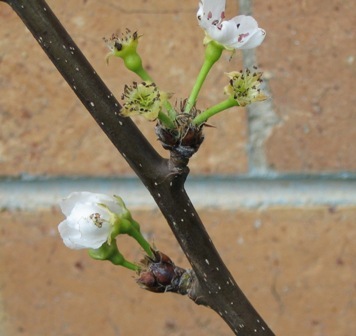 The Nashi Pear is beginning to flower, and its pollinator, the Williams Pear, is just beginning to bud-burst. These are both espaliered, so I’m hoping to get some good growth to train them along the wires of the trellis. 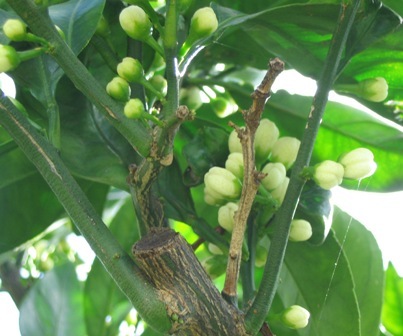 Mandarine tree heavily laden with flowers, which will all become fruit! 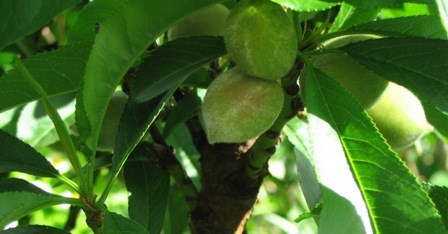 While some trees are still flowering, some others are in a bit more of a hurry, and are already beginning to fruit. The small Lisbon Lemon, about 2 foot high, is producing its first ever lemon. Most of the 25 trees in this garden are so young this is the first time they’re bearing fruit, so it’s all quite exciting! Young lemon tree bearing its first ever fruit, plenty more to come! And not to be outdone by its brethren citrus, the dwarf oranges are not far behind. The Valencia and Navelina oranges are true dwarf trees, they are grafted onto a "Flying Dragon" rootstock, which limits the tree’s growth to around 5 foot, making these ideal for growing in large pots if space is a real limitation. Both were in a pot and were put into the ground when I built the garden. They’re both only two feet high, and managed to produce half a kilo of oranges each. They were barely able to hold them up and bent under the load. You can get all manner of citrus grafted onto these rootstock. I also have a dwarf Tahitian Lime, and that’s still tiny at only 1.5 feet high, so I’m hoping it does some major growing this year. The stately Babaco tree is carrying its more recent fruit over from last season. This tree is amazing, it’s always carrying fruit continuously. While it is still ripening these fruit, it will flower and start fruiting anew at the same time. I am waiting till the side shoots or offsets coming off the stem grow a bit larger, so I can cut them off and propagate more of these trees. 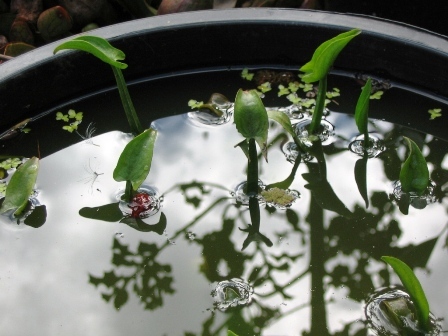 Babaco is sterile and does not seed, it it manually reproduced from cuttings. For some trees, the race is on! This Black Mulberry isn’t wasting any time. It’s a 5 foot high bush sitting in a 45cm wide pot, and it’s totally loaded with berries. The reason why it’s in a pot is because these turn into huge trees, but I couldn’t resist to see how much more productive it would be in the ground, so I’ve already taken a cutting and put it in one of the garden beds, to the south side of the garden so it doesn’t shade out any plants but shades the house from the summer sun. I’ll keep it pruned down to about 8 feet high, and all the prunings will make a great supply of cuttings, which I’ll use to propagate the plant, so I can then give away mulberry plants to people so others can enjoy these wonderful extremely sweet berries. If you’ve never tried black mulberries, they are so sweet, and so messy, and stain everything! Incidentally, the fruit are quite soft, which means they don’t transport well, which is why you never see them on sale at the greengrocer. There’s nothing like eating fresh mulberries straight off the tree! Black mulberries , yes they’re not black yet! They start off green, then turn red, and finally turn a purple-black colour when they finally ripen. There are even more dwarf trees, there’s a Dwarf Peaches and Nectarine too. These are grafted onto a "Pixzee" rootstock, which is a dwarfing plum rootstock, which restricts the size of the tree again to around 5 feet, though the fruit are still full sized. I’ve experimented with propagating the rootstock, and grafting peach onto it and it takes perfectly, reproducing the store brought dwarf tree. Another great container tree or ideal specimen for small spaces. It’s not just about the trees, the shrubs are doing their thing too. While the redcurrants and blackcurrants are still putting out leaves, the raspberries already are beginning to flower, as are the blueberries. I’ve read that blueberries are more productive when you add another variety of blueberry nearby. I’ve added one more of another variety about 15 feet away to see if this makes a difference. One thing I’ve noticed with blueberries if that they have a really productive year, then a really quiet one. My first blueberry produced a large amount of berries the first year in a pot, then did very little the following year in the ground. This is the next season, so it should be more productive this time round. Blueberries require acidic soil, and the simplest way to get an acidic soil pH, and get nutrient to the plant, is to pile heaps of organic matter around it, and let it break down – this is basically cold composting, which is more anaerobic and produces acidic breakdown products. I’ve also piled on a thick mulch of pine needles which make the soil acidic as they break down. 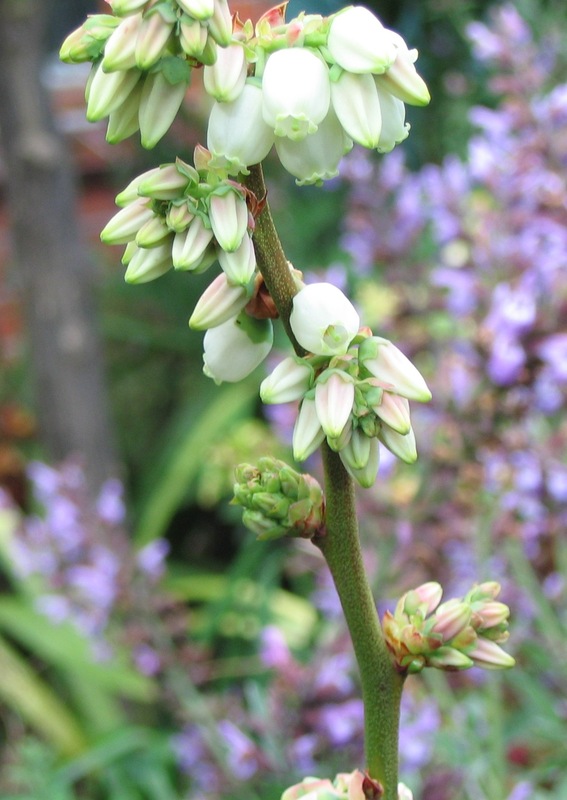 Also make sure that any plants you grow around the blueberry can cope with acidic soil! An interesting fact I thought I’d mention, Blueberries are part of the Ericaceae (Heath) Family, as are rhododendron and azalea, which also love acid soil. Let’s go a bit closer to the ground where plants are emerging from the soil. The asparagus has been producing consistently after the correct preparation. 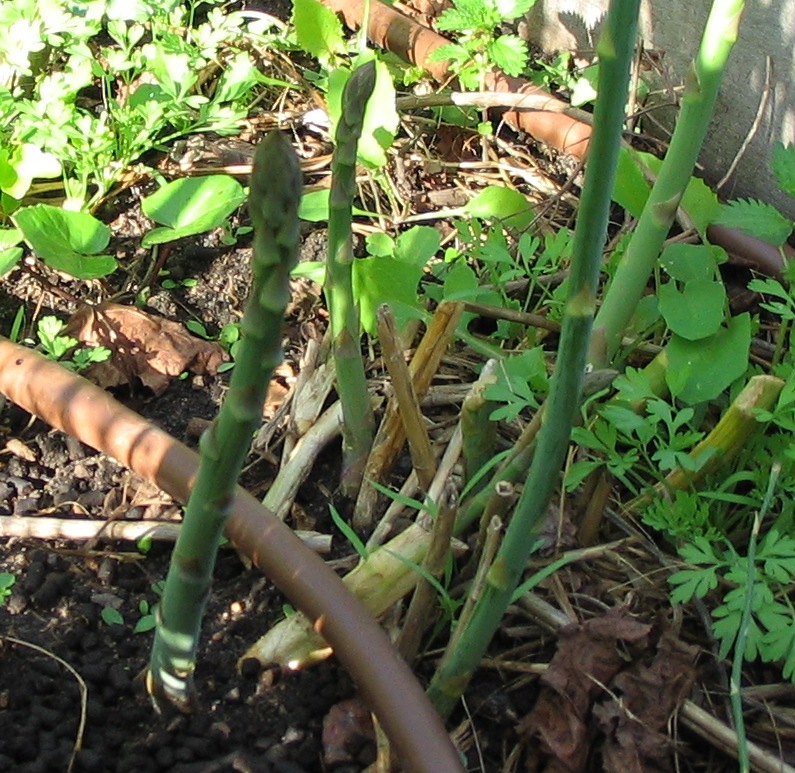 So, how to you look after your asparagus? For the first year you do not harvest, just let it all grow so it can build up a good supply of nutrient in the crown (root), and it will then produce consistently. 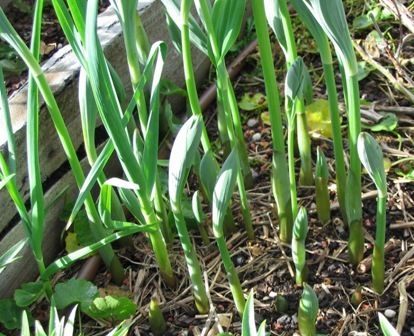 When the asparagus spears emerge, cut only the thicker spears, leave the really thin ones , they will eventually grow longer, the tips will open, and it will become woody and start branching. This will then grow into fern-like foliage, which will produce food for the plant, and store it in the crown for next year’s production of asparagus spears. And, if you need more plants, you can dig up and divide the crown when it is three years old. The most amazing thin about plants that emerge from the soil is that they transform a bare patch of winter soil to a fully planted patch. And what’s even more magical is that may of these plants multiply themselves by division, so more of them come up each year. Such is the case with my Solomon’s Seal (Polygonatum biflorum) plants. It is an ornamental, a medicinal herb and a companion plant. 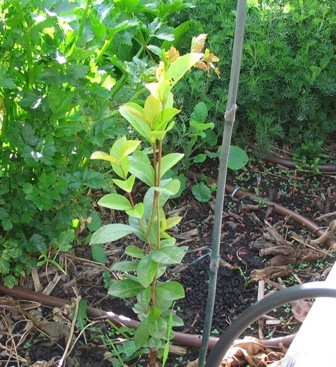 It can tolerate shade and acidic soil, so I grow mine under the blueberries as companion plants. Last year, there were four or five stems emerging from the ground, now there’s plenty! Its flowering and fruiting time for strawberries too. I have about thirteen different varieties growing, they were once separated and labelled, but they’re now thoroughly mixed together, and they are all at different stages of growth. The advantage is that this extends the productive season and each time you have strawberries they usually taste different. This was by chance not intention but has worked to my benefit. Realising that this can be advantageous, I put a few strawberries in a blender with water, and ran it really briefly on the lowest speed, just enough to separate the seeds without damaging them. The seeds separated beautifully – they sink to the bottom. Just grow them like any other seeds (plant in damp seed raising mix and keep moist) and you’ll get hundreds of strawberry seedlings. 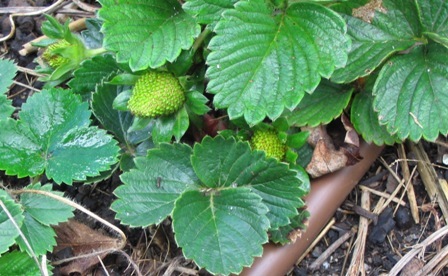 Just remember, strawberries grown from seed will not bear fruit in the first year, but will begin on the second year. So if you find a strawberry that you like the taste of, take a few, blend them to get the seeds, and plant them up. Now, I’ve added a few more plants in the garden. The first was an extra guava tree. 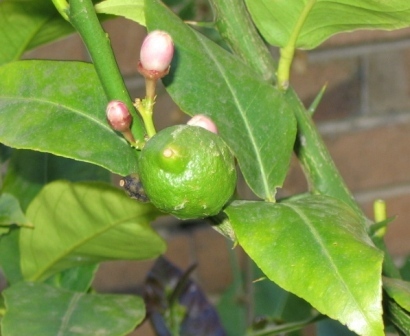 I already have a Cherry Guava (syn Strawberry Guava), and a Pineapple Guava (Feijoa), and I’ve managed to get hold of a Yellow Guava (Lemon Guava – Psidium cattleianum var. lucidum) tree. Yellow guava, similar to the cherry guava except that its fruit are often slightly larger (1-2"). Flesh is yellow, very fragrant, with the suggestion of a lemon-guava like flavor. 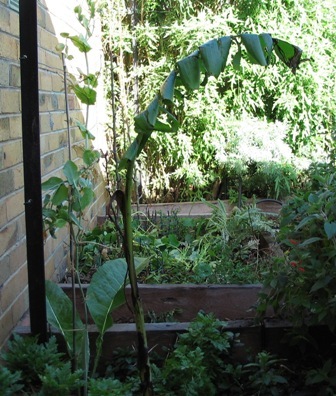 And while the theme is tropical edibles, I’ve relocated a banana plant to a better lit and warmer part of my garden, near the espalier pears, with a north facing brick wall behind it to retail the heat. 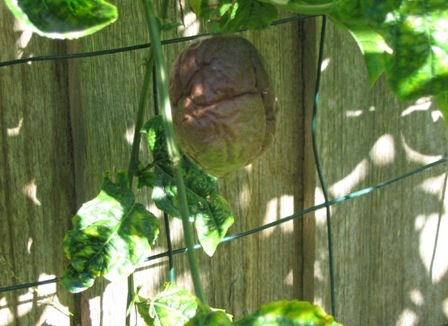 Lets’s hope it survived the transplanting process. Even the companion plants have pretty flowers. 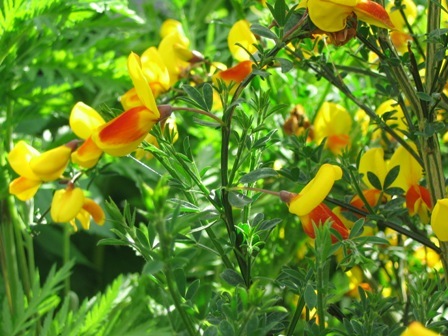 Here’s the controversial Scotch Broom (Cytisus scoparius), with its stunning orange and red floral display. It is a pest repellant, and is great planted between trees for this purpose. It also exudes substances which helps the growth of its companion plants, as well as being a nitrogen-fixing plant. It is deep rooted, and cycles nutrients to the surface for shallow rooted plants to use, and encourages earthworms, soil aeration, and drainage, as all deep rooted plants do, they break up the soil and therefore make it more friendly to earthworms. Scotch broom is a prodigious seed producer. The seeds have hard coats enabling them to survive in the environment for up to 80 years. The seeds are transported from place to place in mud stuck to vehicles, equipment, shoes and the feet of animals. Seeds may be carried via runoff from roads into streams and gullies. Then seedlings may establish along streams and gully walls. Scotch broom forms dense brush fields over six feet tall. Mine is in a heavily planted and mulched garden bed with no bare soil, so seedlings rarely come up, and if they do, they soon join the mulch. I harvest all my plant seeds, so watch what my plants are up to, and I can choose to cut off the seed heads before they develop if I want. 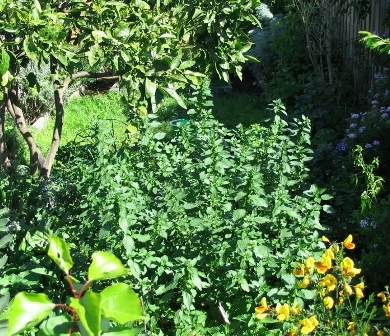 I have mine planted between an apricot and plum tree, along with tansy, soapwort, southernwood, self-heal, raspberries, horseradish and lemon balm as companion plants. I think it’s got plenty of competition personally. I remember the words of one of my Permaculture teachers, Geoff Lawton "…no plants are speciated for evil, they are Pioneer Plants, think of them as hard working immigrants…" If the plant’s natural traits for survival are an issue for you, you can always use sterile varieties of Cytisus that are specifically bred and grown as ornamentals. While I’m on the topic of flowers, there’s a few more I’d like to share, this amazing pink flower is a Lime-scented Pelargonium (often called a scented geranium). 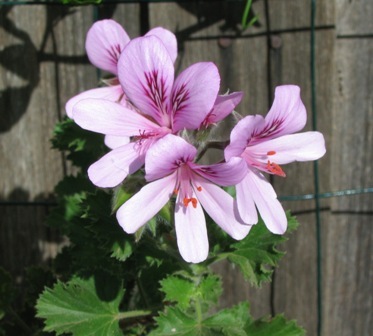 Yes, the scented pelargoniums are valuable companion plants with pest repellant properties, and they add real interest to the garden, kids love the amazing range of scents in a fragrant garden. Scented pelargoniums come in a wide range of different scents (or flavours) too. On the garden boundary are a range of fragrant pest repellant plants, located upwind on the west side to confuse pests who locate their food by scent. I have a variety of different scented pelargoniums, and the good thing about them is that they are very easy to propagate by stem cuttings so you can create a large number o them in very short order. Just to push the boundaries a bit, here are some more flowers… Roses? In a permaculture garden? Well, to be honest, I had to retain a few ornamentals. 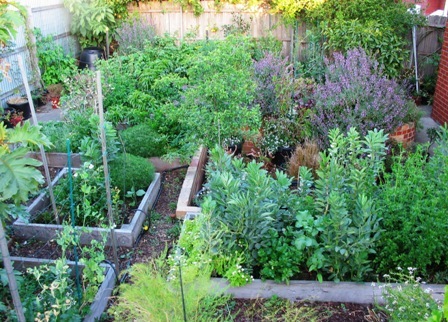 A creative permaculture designer can create around fixed elements in the environment. So I just treated them as a fixed element. 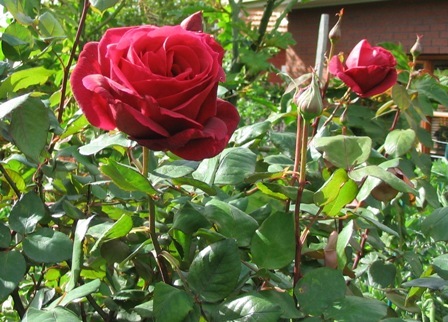 These roses serve as a light shade for an extensive underplanting of strawberries. They are interplanted with chives, which are fine with strawberries, and help repel pests on the roses. Additionally, it gives me somewhere to plant all my chives. The bonus is that the roses look pretty, and are very fragrant old fashioned roses with heavenly scents, so when I walk past to work in the garden, it adds to the sensory stimulation of the garden environment. Fragrant red roses of course! Now the only area left to cover is the water, and here are some of my aquatics. These little arrowhead (Sagittaria) plants are beginning to emerge, the tubers are edible, and the plants are also called "Duck Potatoes" for this reason. If you plant a handful, they multiply into dozens by the end of the season, they are a highly productive plant. 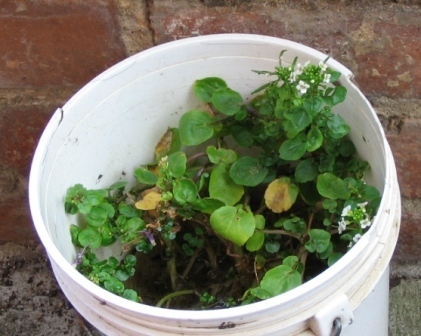 Simple to grow, just fill a container that will hold water about three quarters full of soil, plant the tubers, then add water till it’s about an inch over the soil. When the plants emerge, you can add more water so you have about 4" (10cm) of water above the soil. You can have the water up to a 1′ (30cm) over the soil. The plants will grow around 1-1.5 feet high. Aquatic plants can be so surprising. Here’s what happened after I left a small cutting of Watercress in a small bucket of water and accidentally left it in a semi-shade spot for a few weeks. It filled the bucket, and is flowering. No care, no nutrient, nothing! It’s that easy to grow. If you’re going to eat it, and yes it is edible, make sure it’s not growing in polluted water sources. That’s just a small slice of the life exploding forth from the garden in early Spring! Now that we’ve gone through a whole year since the construction of the garden, it’s time to tally up the harvest figures. But one task remains, to harvest the potato patch, it’s time! Well, you cant see the potato patch anymore, because most of the potatoes have died down, indicating that it’s time to dig the tubers out of the ground. 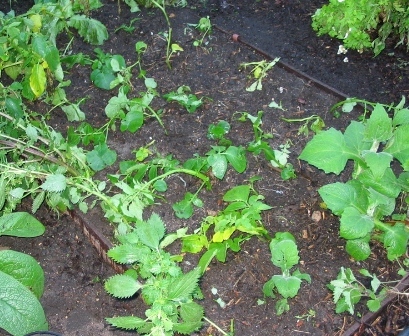 Even more so, you cant se anything because there is a two foot high bed of stinging nettles growing over the bed. It’s OK, I like them there, they protect the soil, and support beneficial insects, as well as doing countless other helpful things for the garden that would require a separate article if their own to do them justice. Heres what it looks like! Potato patch is now a nettle patch, this is succession planting at its best, no bare soil here! 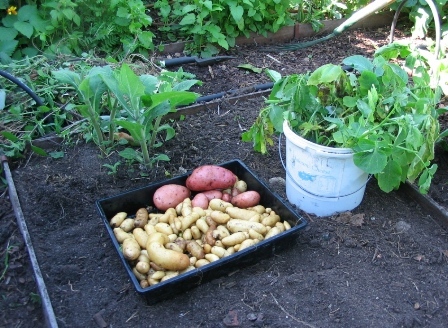 Using a garden fork, the whole patch was dug up, and here’s the result – over 2.5kg of potatoes. Just over 2kg of these are Kipfler potatoes, that’s that is grown in this patch, while the other 0.5 kg were a few stray Desiree potatoes that somehow found their way in there. Here the idea is quality, not quantity, otherwise I wouldn’t be planting the small, expensive, flavoursome Kipflers, and would instead be growing some of the bigger and more common varieties. This patch is about 1.2 square metres ( it’s exactly 2.8 x 4.3 feet, that’s 12 square feet in size) in size. This harvest was the one coming out of winter, so it’s been smaller than the summer harvest. Any young potato plants were put into a small bucket with some water in it so their roots don’t dry out, ready to be put back into the ground after all the potatoes have been harvested. I did the same with half a dozen nettles, we put the beneficials back in too! All the potatoes that are too small are replanted straight back in, as are any green ones. If potatoes turn green (from exposure to light while they were growing), they produce compounds which render them inedible, basically, they’re toxic, so these go back into the ground to produce plants and more tubers next season. Incidentally, I’ll dig in some compost, and add whatever is at hand (organic of course) to replenish the soil after all this, so as not to deplete it, otherwise the constant harvesting will reduce the yields of potatoes and damage the health of the soil. It’s not all potatoes in the potato patch either. 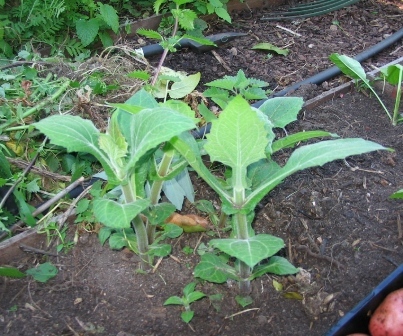 The two plants pictured below are Yacon (Smallanthus sonchifolius, formerly Polymnia sonchifolia). also known as a Peruvian ground apple. There’s also a horseradish planted pictured in the far right corner. It’s a great companion plant to protect potatoes, as well as fruit trees, from fungal attack. One horseradish plant on each side of the potato patch should be sufficient to protect the potatoes. Yacon is a perennial plant from South America that produces a sweet edible tuber. It is from the same family as sunflowers and Jerusalem artichokes, but is not invasive like the latter. The tubers are harvested when the top dies back. The tubers can be eaten raw or cooked, juiced or made into a syrup for use as a sweetener in cooking. The taste is excellent apparently, reminiscent of sweet watermelon, I’ve yet to try it myself, looking forward to the taste test! Yacon plants that have re-emerged from single tuber planted last year, looks like there’s at least three now! Young horseradish in upper right hand corner. 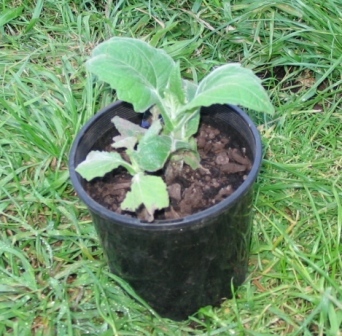 Not content with just those Yacon plants, I’ve procured one more pot of Yacon to add to the garden patch. I found, much to my surprise, there was actually two plants in the pot, all the better! Now it’s time to review the production of the garden over the twelve month period. 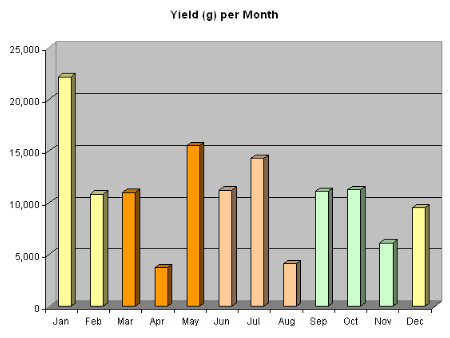 Here are the final figures for the garden yields for the period of Oct 2008 – Oct 2009, the garden’s first year. I can happily say that the annual production for this first year was just over 131kg. The total garden bed area is 686 sq. feet (64 sq. metres). The average monthly amount of produce was just over 10kg. Now that we’ve seen what happened through each month of the year, it is important to see what was actually produced. The important point which I have previously stressed is that all production was not necessarily accounted for here, so these figures are a bit on the conservative side, and I have chosen to err on the side of underestimating yield. Food was eaten from the garden on many occasions (in my absence!) and not weighed on several occasions. It can be seen from the 50 odd kilograms of fruit produced, that generally only small amounts were produced from a small variety of trees. The only mature trees are the mandarine and pomegranate, and the latter was having a low yield year. The mature apricot tree was on its way out due to neglect before I got to it, and had to be cut down and mulched mid season. I replaced it with a very young tree. 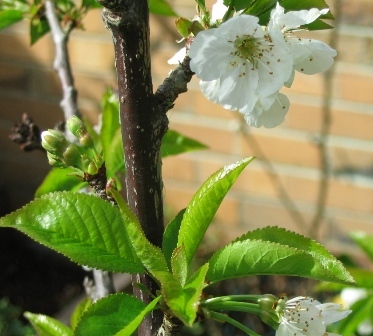 There are now 25 fruit trees in the garden, it is in reality a backyard permaculture orchard. Of these trees, most are still maturing and have a few years to go, and there are about 13 trees that are yet to bear their first fruit. Once they mature, we’ll se more of the true potential of the garden. The main point is that all the plants went into the ground from pots 12 months ago, and are still settling in and growing to size. What is obvious from this whole exercise is that gardens do take time to establish, orchards even longer, and the process of experimenting to determine what works best where is ongoing, and it takes some time to figure it all out. Additionally, I’m replacing as many annual edible plants with perennials, so it’s all still work in progress. I’ll continue developing and refining this garden within the limited space of an urban backyard that I have to work with. My aim is to see how much a I can ultimately produce from an urban permaculture garden sustainably, while benefiting the plant and animal life, as well as the community. So, where to from here? Well, hopefully to an even bigger and better year in the garden! Next Page – 14. Spring Again! Thanks for the great adventure and story of your gardening, its very inspiring to see your great yields and health of the garden. There are always more articles coming too, hope you enjoy them. Very impressive website. It’s also refreshing to see hard facts and stats to see how someone really is getting along. This article is top class. Happy eating! I would like to try the roof! I’m using some of the walls, I have grapes across one wall, another wall has hops, chockos and youngberries along it. It’s all perfectly good vertical space to grow things on. Exactly why Permaculture as practiced in the US is a failed methodology. Bill Mollison would not be proud of that statement. You should know better. There is no way to verify the sterility of Cytisus. Are you a part of the solution, or part of the problem? Why not use the native clovers for nitrogen fixation? Peace out. Hi Bob, Apologies, not sure I follow the message you’re conveying. Permaculture failed in the US? Who’s mentioning sterile varieties of Cytisus, I don’t understand who you’re quoting in each sentence. In regards to Cytisus, fourth year and no self-seeding with a good, thick ground cover and mulch. Why not use native clovers for nitrogen fixing you ask? No need, they are already growing there themselves as part of the ground cover, having the tall shrub creates the over-stacked design. You can stack your companion plants too, that’s how Nature grows them. 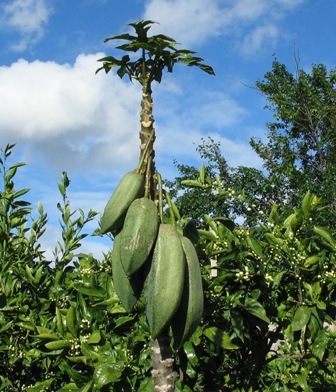 A better way to grow Babaco is to let ONE side shoot grow from the bottom then stop the main growth at six feet pick fruit as it ripens then cut the main shoot into one foot lengths and plant deep this will give you as many plants as you will ever need. The side shoot now becomes the main growth for the next crop.